mosquito | What Year Is It? This Artist May Still Be Alive! This painting was originally shown locally over a year ago. But I have done a minor upgrade since, changing the text to: ‘This painting will be quiet if you don’t wind up the sea-monkey!’ As this painting has been hanging on the wall for a year, I thought of many more phrases to hang next to this grimacing guy, until I realized I should just state was is plain fact. That monkey will never slam it’s cymbals together if you don’t wind it up! The original prebreen was/is a Pelbam sea captain painting and was safe for a while, since, after first painting the frame gold, I thought it then looked too fancy to breen! But then I hatched this idea, and, well, no painting is safe in my house. This isn’t the first sea monkey captain I’ve done, but it is the first sea captain CYMBAL monkey. 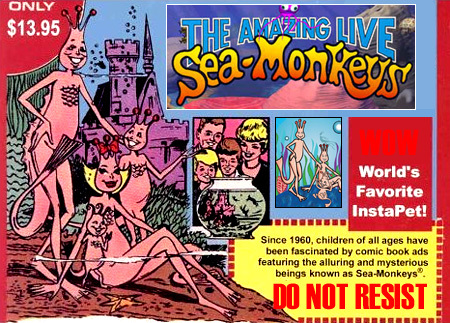 The text originally said ‘Do Not Resist’ which, was text on the old comic book ads for sea monkeys! Do not resist our completely false advertisement! Buy the shrimp and try vainly to imagine them as tiny apes! On the the original breen I pasted an off-center monkey face on the captain (note the pipe coming out of the side of his head), with the familiar cymbal monkey grimace. The effect here is that your eye darts around, off-balance, and you feel increasingly agitated, the way you would if the cymbal monkey was actually, annoyingly, slamming the cymbals together! Monkeys hook arms around the outside of the painting as they do in the barrel full of monkeys game, and a numerical code describes the meaning of the painting’s elements on the very inside of the frame. The pipe bubble gives the solution to this EXTREMELY simple code. Various Ipswich insects grace the painting including the greenhead fly, the mosquito and the deer tick(arachnid).